In today’s climate, it’s crucial for businesses, especially those small-medium sized (SMBs), to maximize efficiencies and reduce unnecessary operating costs. A simple and effective way of doing this is to digitize documents. Though many offices are adopting digital processes and technology, the fact of the matter is that a lot of information – invoices, customer information, internal employee files – are still in paper format. Not only does this increase printing costs, but it also requires additional office space for secure storage. It may not seem like storing physical documents will have a significant impact on a business’ success but in the case of SMB’s such as doctors’ offices, law offices, accounting services and so on, the task of accessing information may turn into a time-consuming process. Furthermore, it presents escalated security risks and can inhibit customer service. Data security and protection is a key issue for businesses to consider. With paper documents there is greater risk of these being damaged, stolen or lost through fire, flood or theft. By maintaining information in digital format, you can significantly reduce such security risks. Reducing the amount of paperwork and unnecessary filing cabinets can free up office space to make way for more employees or collaborative working spaces. It can also reduce utility costs and any insurance you may need to add, such as theft and fire for highly secure documents. Reducing the amount of paper and other operations cost by disseminating information in digital format also reduces the amount of waste. Become a green company by introducing green processes and educating employees on the benefits of going Green. When documents are converted to a digital form, retrieving them is much more efficient. Gone are the days of long hold times for customers while an employee retrieves their file. With digitized documents, only authorized employees can access documents with a few clicks of a mouse irrespective of users’ location. Reduce your storage costs and resources needed to maintain and retrieve records. Improving productivity will open more opportunities for employees to focus on important tasks and enable them to take on additional responsibilities. 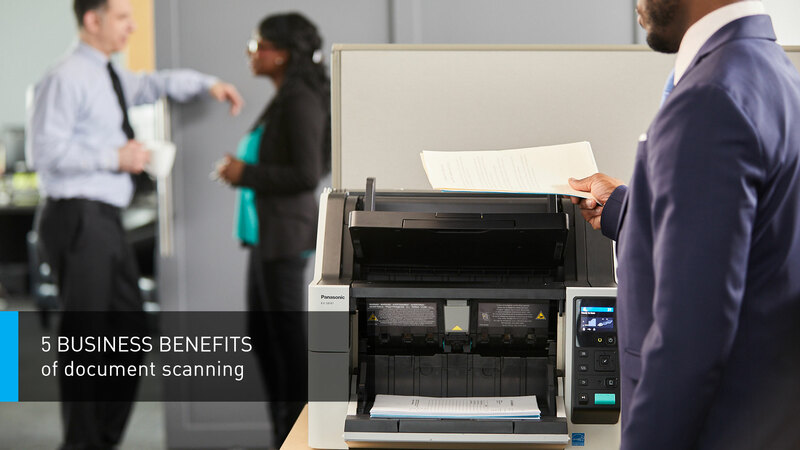 Designed with SMB’s in mind, Panasonic’s new line of Network Scanners combines advanced network security, flexible connectivity, easy-to-use powerful features and the reliability of its award-winning technology to provide a fully-connected document management and imaging solution. The implementation of these solutions will eliminate the need for manual scanning and data entry with the ability to scan directly to shared folders, email or fax at the touch of a button. Enhanced features include duplex and batch scanning, scanning of long-form documents, local user management and remote administration. To learn more, please visit: Panasonic.com.